I hope the readers know about the online platform called Quora. For those who don’t know, Quora is an online platform where people from all over the world can pose questions from any topic imaginable. Those questions can be answered by anybody who wishes to provide an answer. Sometimes the users are also graced by answers from people well established in the field of the question asked. The best part of my experience has come from them. I have had the pleasure to learn about views of such people. Reading those answers is absolute bliss. That is mainly because I love gathering knowledge about different issues. My point is, would the process of preparation for an examination change if the next guy has one month more or less than the previous guy who asked a similar question? Now comes the awful part of my experience on Quora and unfortunately, it overshadows the good experience. I’ll explain in a while, how. Back to the topic of repeated questions, it is quite irritating when you are asked the same question over and over again even though the answer lies there itself. There are people who use Quora to solve a query when they should use Google. A few days back someone asked about the requisites for teaching position in IITs. The information is clearly given on the webpages of the respective IITs. Am I expecting too much by asking them to search for the available information first? No, I don’t think so. It is the moral responsibility of a person to do so otherwise his or her brain is just a vestigial organ. 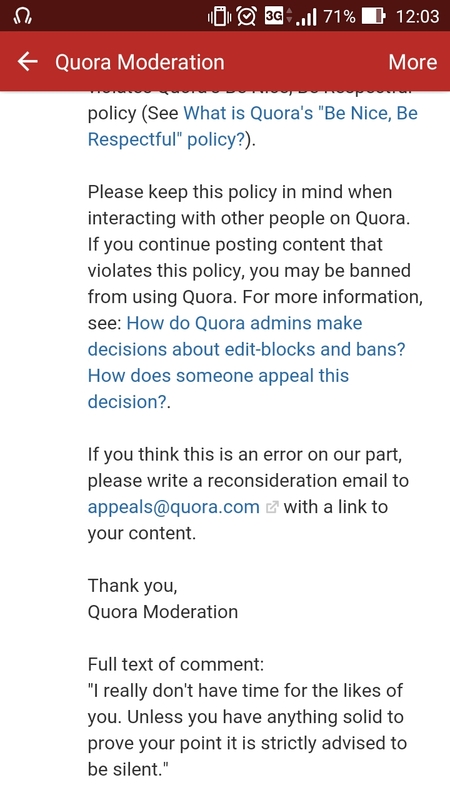 But, if you point that out to that particular person, Quora moderation team will send you a message that you were being extremely disrespectful and such repeated actions may lead to blocking. Believe me, I was much more polite when telling him and I believe I have the right to dissent if someone irritates or insults me beyond a limit. So, it got me thinking. How come Quora, which is purported as a wonderful background allow such nonsense? After a little pondering I reached a certain conclusion which answered all the observations. Quora is based on a simple concept. People always have questions but they don’t get the answers due to limitations of contact. Quora administration built an online platform which removes these limitations to a great extent. Curious people can post questions and tag the related topics to the questions. Someone else who knows about the topics would provide an answer. There’s also a follow button in case someone finds the given questions interesting or had similar questions in mind. The idea in itself is beautiful. The structure of the platform is not. There are a few policies which are not only asinine but also extremely irritating. For e.g. 1. There is a policy where the answer should be descriptive in order to understand better. Yes, I agree. Answers should be self explanatory. But you can’t expect one to describe one word answers. There are certain questions which can be answered with a simple yes or no, no details required. Quora moderation expects you to describe the yes. 2. 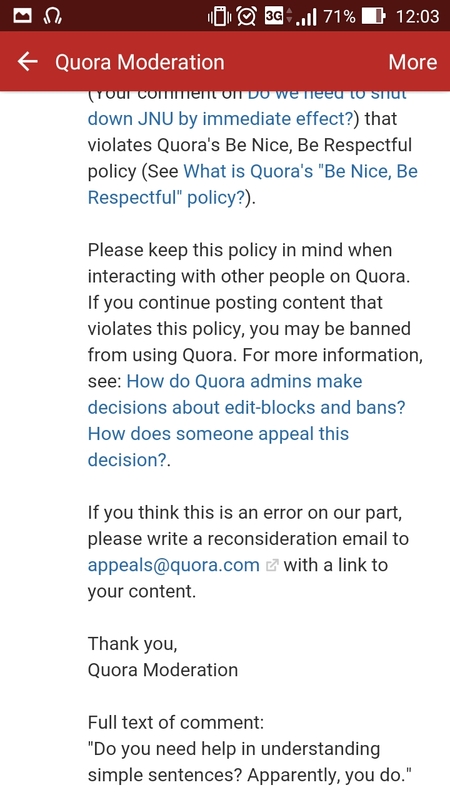 There is another policy which says Quora users should be respectful. Again, I agree. 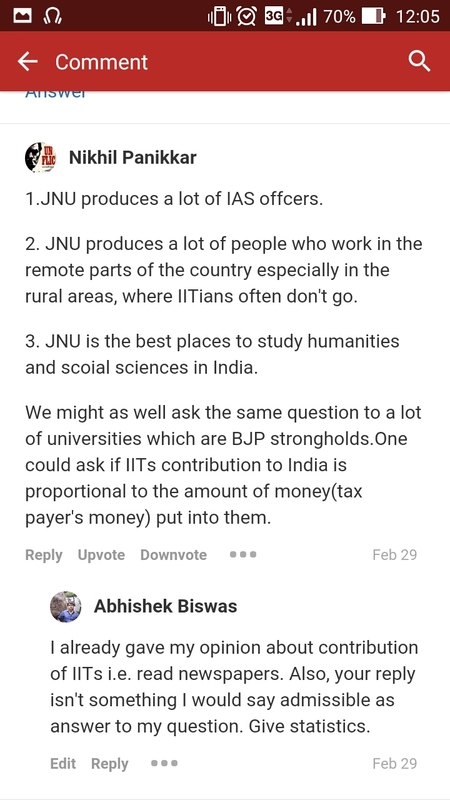 But sometimes there are people who will ask the same question again and again even though the answer is already present in Quora. How long can someone be expected to keep his patience in such scenario? Then I had an argument with someone who was not ready to do it logically. Following which I got blocked. I have attached a picture for the readers to calculate the situation. On top of it, the moderating team never replies to or acts on complaints. They do have an email address for user support but it works like an office filled with clerks. If you send an email to the provided address, they will revert back in sometime with three more email addresses. The content means that the moderating team is too busy to sort out complaints. So, the user should send the complaint to one of the three email id’s which is more appropriate. My question is, if the email address provided on Quora is not the appropriate one, why can’t they mention the email addresses there itself. Why force the user to waste his time to write a mail which won’t work at all? These observations have led me to believe, the Quora team is actually filled with people who have much less sense than is required to smoothly run such a platform. They have assumed that the idea and basic maintenance of servers would keep the platform running. I understand that unhappy customers sink a business. I believe the Quora moderation should respect that too.